Commemorate your special anniversary by giving your friends and family a retro glass jar filled with a treat of your choice. Choose from a variety of classy designs and colors along with 2 lines of custom text. 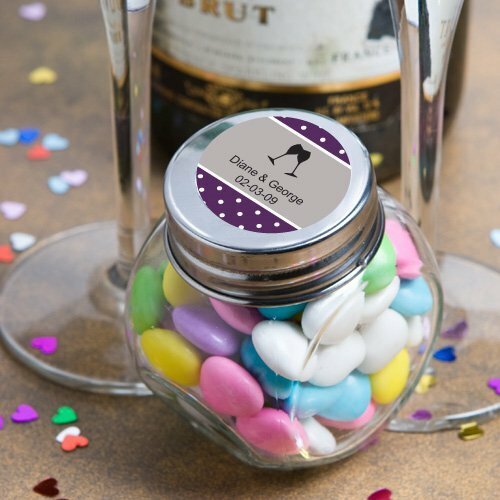 Designs are available for just about any theme and would work for any anniversary, but we do have specific designs for 50th, 40th, and 25th anniversary wedding favors. Each reusable glass jar measures 2 3/4" x 1 3/4" complete with a metal screw on lid. Assembly required - Personalized labels are self-sticking for easy application. Hand-washing is recommended prior to filling.